Mireille Balin was a Monaco-born film actress and fashion model, she was an internationally popular star and considered to be one of the finest actresses of French cinema of the 1930s. Balin had a Sun / Neptune conjunction which is quite common amongst glamorous film stars of the time as Neptune adds a touch of fantasy to their image. The Sun is in the 9th house and Jupiter is rising so this indicates that her fame would spread beyond the French borders. This is a very difficult chart however, consisting of a Grand Cross between the Sun, Jupiter, Mars and Uranus and a T Square from a Moon / Saturn conjunction in opposition to Jupiter and the Ascendant and square to an apex Mercury. The most difficult part of the chart is where the two patterns converge around the 7th house of relationships with a Mars / Moon / Saturn conjunction. Saturn in the 7th house is going to bring difficulties or frustrations in relationships but as part of this pattern would inevitably attract serious trouble. Balin’s acting career was at its peak as Pluto was conjunct her Sun from 1934 – 37. The war changed things for her particularly in 1942 when she fell in love with Birl Desbok a young Wehrmacht officer at the German embassy. After the liberation of Paris in 1944, Balin and Desbok tried to leave the country but were caught by the French resistance. She was raped, beaten and put in jail, he was almost certainly killed. Balin was released at the end of the war and made an attempt to return to the cinema but her pre war status had been lost due to publicity about her affair and imprisonment. Her health suffered and she had a stroke and meningitis in 1949. She spent the rest of her life in poverty and obscurity. Pluto transited the T Square from 1942 – 49. It was exactly conjunct the 7th house cusp and opposite the Ascendant in 1944 – 45. 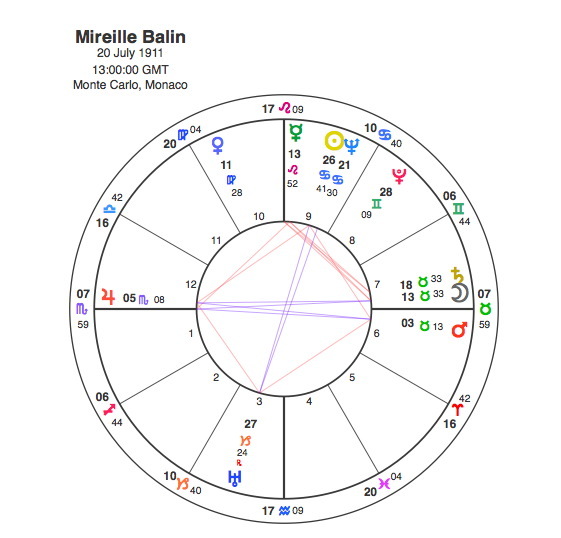 Mireille Balin’s Moon / Saturn conjunction in the 7th meant that she couldn’t help falling in love with the enemy during a time of war. The difficult aspects in her chart ensured that Pluto made her suffer for it.